Bill Marriott drives himself to the interview at the Marriott Suites in Bethesda, just outside of Washington, DC, and he declines help with his coat. But when it comes to having his picture taken, he issues clear instructions: No photos sitting down! He prefers a standing pose – crossed arms, shining cufflinks – just like the photo in his office, which shows him with his late father, the founder of the Marriott hotel empire. Modesty and a sense of tradition define the son, who at almost 80 is now the patriarch himself. His inner driving force is his religion. Marriott is Mormon, and he believes that his faith is the basis for his success in business. The Presidential candidacy of Mitt Romney is shining a spotlight on his religion – and on other famous members of the Church of Jesus Christ of Latter-day Saints. 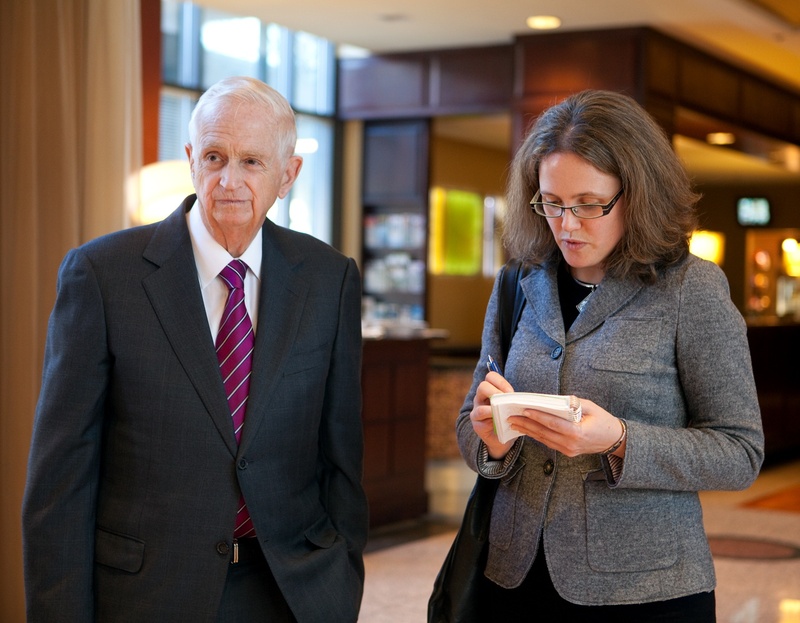 Like the Romneys, the Marriotts are one of the first Mormon families in the U.S. Bill Marriott is an important donor for Romney’s campaign – just like his father had supported the failed Presidential run of Romney’s father George in 1968. He agreed to talk about his faith to Capital magazine. Erika Larsen captured a glimpse of his strict yet mild personality in her photos. The story of the Marriott family is an American pioneer story. They settled in the arid plains of Utah. Bill Marriott senior moved to Washington, DC in 1927 where he started what is now a global business with a Root Beer stand on 14th Street. His son claims that the Mormon teachings of hard work, self-subsistence and strong family values made it possible to live the American Dream. Other successful Mormons agree. Harvard Business School professor Clayton Christensen believes that his famous theory of disruptive innovations does not only apply to technologies like the iPad, but also to the Mormon religion, which, in his mind, at its founding in the 19th century, revolutionized Christianity in a similar way like Martin Luther. This entry was posted in Americana and tagged Bill Marriott, Mitt Romney, Mormonen, Mormons. Bookmark the permalink.